Many commenters hail this shoe as one of the best basketball shoes from Adidas. A lot of players agree that the Harden Vol. 1 Primeknit is a well-balanced shoe and covers their needs from traction to support. Majority of the purchasers love the look and feel of the material, adding that it feels very premium. Wide-footers are happy about the fit of these James Harden basketball shoes. Even with the softer Primeknit on these Adidas basketball shoes’ uppers, a couple comment that the shoe offers better support than the original model. A lot of users say that the Harden Vol. 1 PK looks aesthetically pleasing and can be rocked casually, not just on-court. Players with wider-than-usual feet appreciate the Harden Vol. 1 Primeknit’s fit. 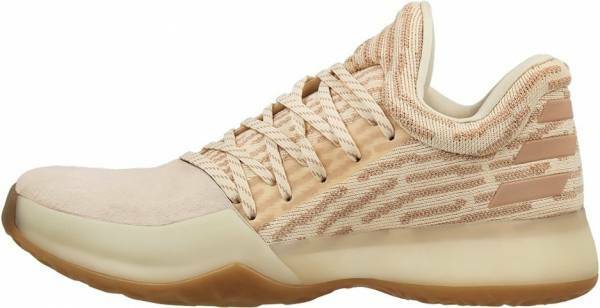 A lot of wearers say that these James Harden shoes feel great after they’ve been broken in; the Primeknit upper also makes the process of breaking in more comfortable. A few users appreciate that the laces used on the PK version are flat ones since they don’t untie as much as the round laces. The Primeknit version of James Harden’s first signature basketball shoes also run a size bigger. It is recommended to go down half to a full size smaller. Many reviewers say that the toe cap is a bit uncomfortable and needs to be broken in since it can bend and cause painful pinching in the forefoot area. Some players feel that the toe cap is merely for decoration, adding that removing the shroud makes the shoe perform so much better. The forefoot band of the 3rd James Harden basketball shoe has similar impression from wearers. Regarded as generally better than the original Harden Vol. 1s, these Primeknit James Harden sneakers are said to achieve a great balance between on-court performance and streetwear aesthetics. The signature shoe offers premium materials at a good price, most especially if bought on sale. It's a very great performer. There's really no difference between the two other than the $20 price increase. The Primeknit and suede mix not only give a good performance but they also give the shoe a unique look that makes it look a lot different from every other basketball shoe that's out there. The Adidas Harden Vol. 1 Primeknit is a premium upgrade; providing grippy traction with its clear outsole, impact protection and court-feel with its Boost cushioning, and sufficient support with its soft and high quality Primeknit upper. Cushion. Just like the original Vol. 1, the Primeknit version has the same full-length Boost in its midsole–ensuring the right balance of comfort, bounce and court feel. Traction. Made based on data pulled from Harden’s actual foot movements done in the Adidas Innovation Lab, the Fibonacci-inspired shapes work in tandem with the athlete’s style of play. They also provide the everyday player with top-notch, floor-grabbing outsoles. Length and Width. The Primeknit version of the Adidas Harden Vol. 1 runs a size bigger. Wide footers can stick to their standard Adidas basketball shoe sizes. However, for players with regular-sized feet, it is recommended that you go a size smaller. Lockdown. Featuring a burrito-type bootie construction, the Adidas Harden Vol. 1 Primeknit ensures proper lockdown. The asymmetrical dual-lacing system relieves lace pressure, providing a snug and comfortable and secure fit. For this model, the upper is made of Primeknit. In place of leather, the forefoot shroud uses suede. The midsole features a TPU encaged Boost for added firmness to the plush cushioning. Lastly, the outsole is made out of clear and pliable rubber. For an increased range of movements, the Harden Vol. 1 Primeknit comes as a low-top. The shoe comes in different colorways and is embellished with Harden’s logo on the tongue, while the Three Stripes are printed on the heel. The regular version of the Harden Vol. 1 has more than sixteen colors available. The Primeknit version, however, only comes in two colorways that the subsections below will discuss in a bit more detail. A more feminine colorway of the Harden Vol. 1, the “Chalk” colorway comes in premium Primeknit upper with Chalk White, Ecru Tint, and Ash Pearl colors. The special edition also features a gum-rubber outsole that completes the whole look of the shoe that is perfect for casual wear. The original colorway of the Primeknit version is the “Imma Be A Star” colorway, which is inspired by James Harden’s refrigerator note to his mom when he was barely a teen. These all-black basketball shoes with gold stitches boast that Harden is surely one who fulfills promises.